Available in your choice of black or white, the Jack LaLanne PJEB Power Juicer is a compact, stylish machine more than capable of extracting high-quality juice from both soft and hard fruits and vegetables. With a generous oversized feeder chute, and push button operation, making juice with the PJEB Power Juicer is simple and easy. Drip-free spout allows you to swap drinking glasses without making a mess, and all the components are easy to disassemble and clean. The PJEB Power Juicer comes with a detailed user manual and instruction guide, which is great because it teaches you how to get the most out of this compact, stylish juicer. With an elegant black/white and transparent design, the PJEB Power Juicer will look great on your countertop or easily store in a cabinet. Built to exacting standards, the patented Jack LaLanne extraction technology in the PJEB Power Juicer will get the most out of any fruit or vegetable. The huge feeder chute cuts down on prep work, and the powerful 3,600 RPM blade will easily scythe through even the hardest fruits and vegetables. It really doesn’t get any easier than using the PJEB Power Juicer. Simply turn on the unit, use the pusher tube to feed in fruits and vegetables, and delicious juice comes out of the spout. Rugged plastic parts are a cinch to clean. Drip-free spout keeps messes from forming on your counter-top. The PJEB Power Juicer handles fruits and vegetables with ease, using the patented Jack LaLanne technology to extract the maximum amount of juice. One-speed 3,600 RPM is more than capable of juicing even the hardest fruits and vegetables. Compact design is still strong enough to make enough juice for a whole family with ease. As with all juicers, you’ll know when this unit is running, but the motor is well-insulated so noise is kept to a minimum. For a compact centrifugal juicer, the PJEB Power Juicer does surprisingly well. The patented Jack LaLanne technology means you get very high quality juice. Inside the box you’ll get the motor unit, the gorgeous transparent pulp collector, pusher tube, main juicer unit, and a detailed (paper) user guide and instruction manual. The PJEB Power Juicer looks so good, you’ll want to keep it on your counter top, but the compact design means it’s easy to store in a cupboard or cabinet. Gorgeous transparent pulp collector allows you to watch the juicer in action, and the whisper-quiet 3,600 RPM blade will make short work out of any fruit or vegetable. The patented Jack LaLanne extraction technology means you get high-quality, tasty juice every time, and the no-drip spout makes swapping out drinking glasses easy and mess-free. Plastic component design means this juicer is lightweight and easy to clean-up, store, or take to a friend’s house for more juicing adventures. Definitely one of the finer centrifugal juicers on the market today. 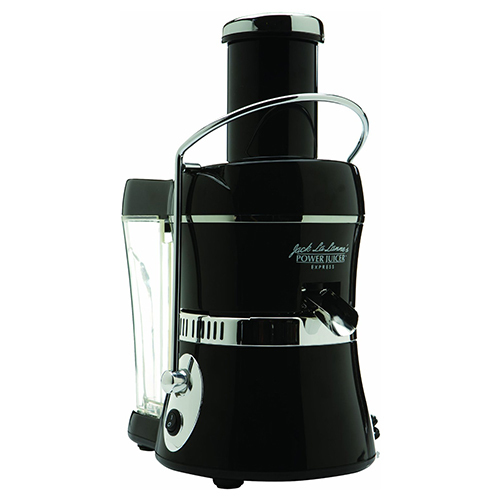 You can find out more about the other models of Jack Lalanne Juicers here. Nutrition For Kids – What Do Children Need To Eat?